Does it have a wolfson DAC? hey guys m planning to buy this phone..??? but heard lots of issue with phone reagrding bug hanging and battery..is dat true???? shud i go for dis or not..help??? 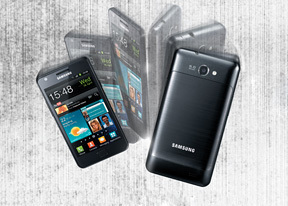 Im just buy this fon..this my 2nd samsung fon after wave bada os..very nice fon n worth to buy it. man this phone is a dream. this ULP Tegra2 can run demanding games without cuts. seen that Galaxy sII phone in game tests not those useless benchmarks and man, on paper it looks good, but in real life, sometimes it cuts. Tegra 2 behaved as expected from a nNidia product. Whats the use of this review. GSMarena.com is so late with this full review. This model has been discontinued and is not available anywhere in Mumbai. In response to query by "k!" You forgot an important bit in the review: IT's GETTING AN UPDATE TO ICE CREAM SANDWICH!!! Great phone, I've owned it for about two months now. Dual core and tegra 2 lets you play high res games and cam quality is great! Latest version of Droid gingerbread + IT's GETTING AN UPDATE TO ICE CREAM SANDWICH! I bought it off Sulekha website and got it for about Rs. 11,000 cheaper than the S II (which is about €140 or $200 when converted). The S-II sells for Rs.30 K and this phone cost me Rs.19 K with a good deal. Moreover, the S-plus is costlier than this phone in India. Sensation XL is almost as pricey as the S II so buying this phone was a no brainer! Considering this phone is like a little brother to the S-II, you couldn't ask for more! KiesAir is complicated to set up. And the normal Kies doens't connect. Why is it that all these latest phones released by Samsung always so identical! Anonymous, 26 Jan 2012Superb phone . . . ! Go grab one for yourself a Galaxy Royale if you want all the top features... morecan u connect it to hd tv?? neon d god.., 26 Jan 2012Hey guys, i own this phone for abt a weak now, n i tell u, its way better than s+ n 10,000inr ... morehi,does it have HDMI out? ?